Would love to have one of these colourful beauties in my home. From Bokja. They are GORGEOUS! And I don't often say that for prints! 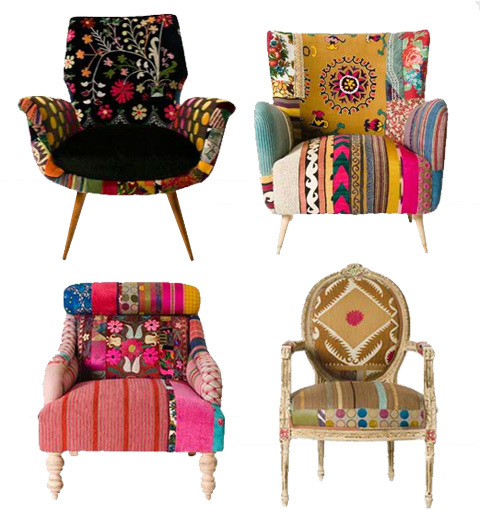 wow, those are really great chairs, amazing colours, so cheerful!! I LOVE these armchairs !!! Love them! Very ethnic and chic! Fabulous!! my coach looks so dull now ive seen those chairs! LOVE these chairs! So quirky, fun & colourful! It sure would brighten up any home! These are great inspiration. I think this would be a fun and lively direction to take a rather sad chair I have been longing to reupholster. It would be a great punch of style in our nursery. Like sitting on a beautifully patterned rug shaped like a chair. *sigh*. These are gorgeous! These are great inspiration... LOVE these chairs! So quirky, fun & colourful! I love these chairs! I've been on the website trying to figure out how much they are and how to purchase them. Thank you for showing them! Ohh these chairs are maid in my homeland Lebanon, Beirut. Good post. I find out something new and challenging on webpages I stumbleupon on a daily basis. It will always be exciting to learn material from other authors and practice a little from other sites. Good post. I find out something new and challenging on sites I stumbleupon regular. It will always be intriguing to read written content from their author`s and practice something of their websites.